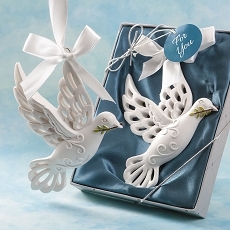 Add a heavenly spirit of love, care and guidance to your next special event with these magnificent Angel key chains! This magnificent Angel is crafted from metal with a metallic gold finish. She features a beautifully intricate scroll design on her outspread wings. Her divine love for all is displayed in a heart shape in the middle. 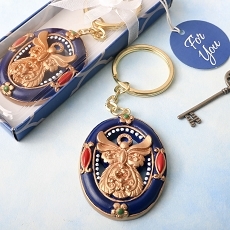 The Angel is attached to a gold metal chain and keyring. She is presented in a golden windowed box wrapped with a gold organza ribbon and bow. 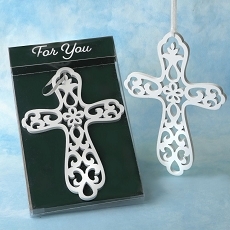 Attached to the bow is an Angel 'For You' tag. 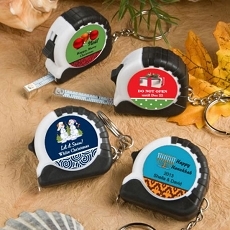 This magnificent and practical key ring favor is perfect for showering your guests with thanks and appreciation at weddings, birthday parties, showers, christenings and religious events. 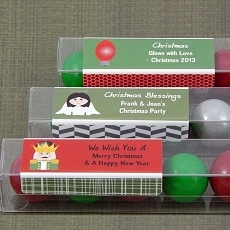 Size 0.5" x 3 3/4"